seven deadly sins, originally uploaded by jenniferlarson. 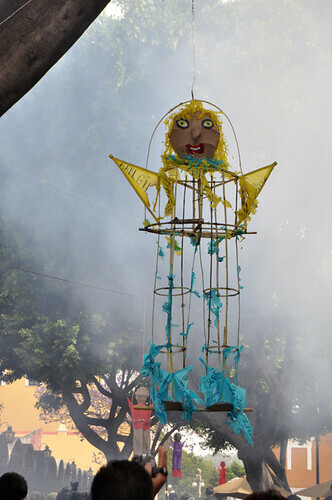 I happened on this Holy Saturday event in Puebla just as it was about to start. Eight of these figures hung from trees. One-by-one a man lit the firecrackers attached to them, which spun them around, then exploded (this one is post-explosion). They represented the 7 deadly sins, and Judas. good friday, originally uploaded by jenniferlarson. We headed down the twisty mountain road back to Puebla, stopping once for us queasy folk to get some air. The largest Good Friday procession in Mexico was passing right in front of our hotel, so the driver couldn’t drop us in front of our hotel. We had to process for a half a block with them to get there. Here the procession ended at the cathedral for a ceremony, and then processed out again. fiesta, originally uploaded by jenniferlarson. We had a party on our last day in the Chicueyaco community, with a pinata, bubbles, games, and many homemade tacos. About a hundred people turned out. mother and daughter, originally uploaded by jenniferlarson. This morning the three women in our group were invited to Juanita’s house (left) where she lives with her 84-year-old mother. There are no roads to her house–we traveled down a rocky trail through coffee trees with views of the mountains and lush valleys below. Juanita’s mother speaks only Nahuatl. Our trip leader, Laura, translated our many questions into Spanish, which Juanita translated into Nahuatl. Then the answers would come back in Spanish and then English. wiffle ball, originally uploaded by jenniferlarson. The kids in our group had fun teaching the children from Chicueyaco whiffe ball. Once they caught on, the teams were pretty evenly matched. palm sunday, originally uploaded by jenniferlarson. Palm Sunday procession in Cuetzalan. The procession started in one church and wound through the rainy cobblestone streets to the cathedral. This statue of Jesus on a donkey was carried by men the whole way. Jesus is wearing plastic sheeting and poncho to keep dry. voladores, originally uploaded by jenniferlarson. Today we traveled to the mountain town of Cuetzalan, where we spent much of our time. We stayed in the Hotel Taselotzen, a hotel run by a collective of women from five indigenous communities. They money they make from the hotel goes back toward their communities. One thing Cuetzalan is known for is its voladores (flyers). Five or more dancers climb up a wooden pole almost as tall as the cathedral. They get back to the ground by “flying” upsidedown by ropes, rotating around the pole, slowly lowering them to the ground. (I’ll post a video.) This voladore stays at the top while the other dancers fly down, helping to rotate their ropes. Then he slid down on a rope.